Drawn and published in early 1942 by C. S. Hammond & Co. in response to the bombing of Pearl Harbor, this is one of the most detailed USA maps of the Pacific ever produced. 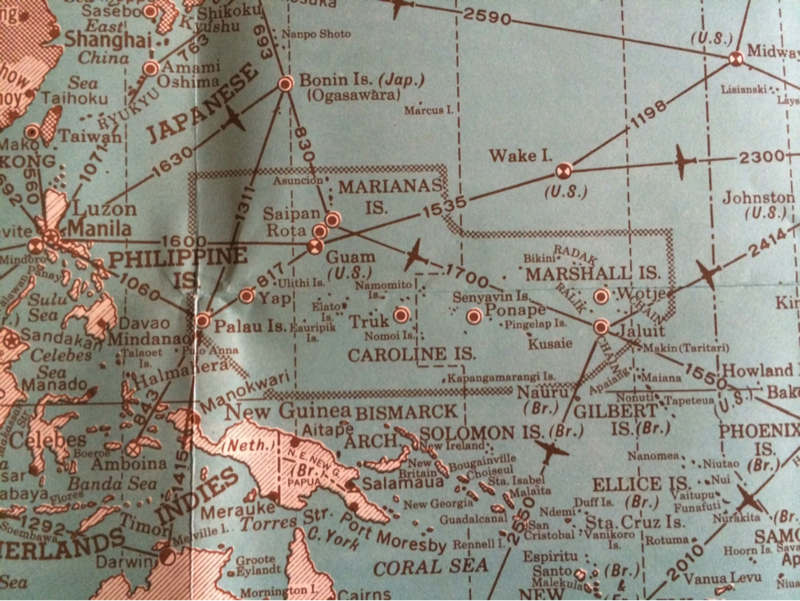 McArthur’s “Hit em where they’re not” and “Island Hopping” campaigns could not be carried out until we knew where every island, atoll and knoll was located. The chart serves as a Pacific Theater “situation” map showing flight routes, distances and possessions as they existed at the beginning of the war. This Pacific centric map demystifies the otherwise mysterious ocean. The Pacific is generally shown incomplete as an extension of the West Coast of North America, Oceanica, North and SE Asia, the Aluetians and the South Pacific. This complete map showing the whole Pacific and surrounding continents and island groupings is a valuable tool in understanding the strategic movement of troops and Pacific war stratagies. Six smaller maps appear on the back side. The Navy has recently declassified and released the Nimitz Gray Book which documents the incidents of the Pacific Theater from Dec. 7, 1941 through the end of the war in 1945. This detailed map can be used to trace all of the military movement and battles of the Pacific Theater with great detail.